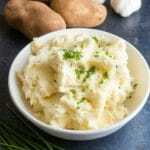 Instant Pot Mashed Potatoes with Sour Cream and Garlic are a mouthwatering side dish recipe that is all done in the Instant Pot! Fast, easy and little clean up! Mashed potatoes are a universal comfort food favorite. 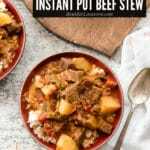 They have never been easier than making them in the Instant Pot. 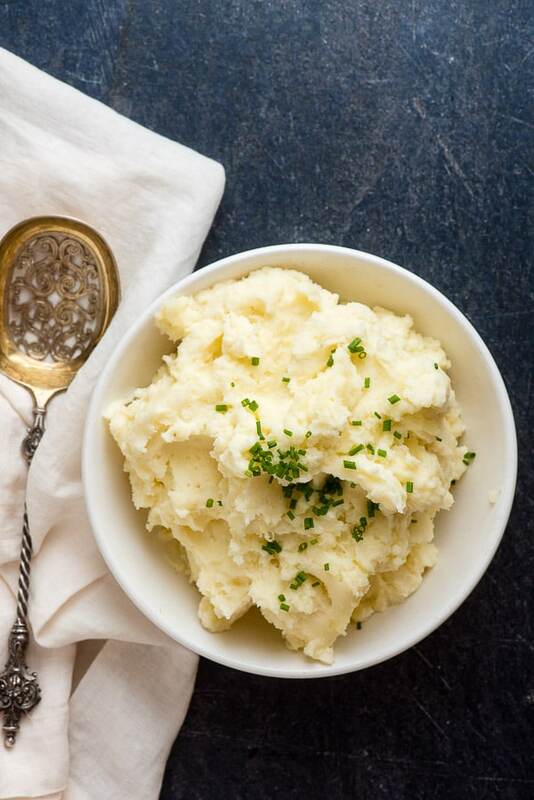 Instant Pot mashed potatoes have wonderful texture and are effortless to make. 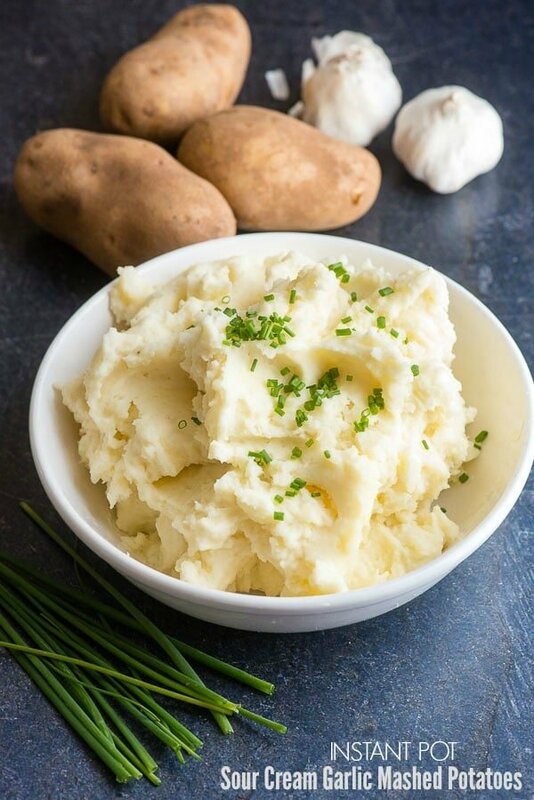 These Instant Pot Sour Cream Garlic Mashed Potatoes cook in 8 minutes and the recipe provides everything happens in the Instant Pot, making it a great choice for busy cooking holidays like Thanksgiving or Christmas! I’ve been having so much fun testing out versions of traditional recipes in my Instant Pot. It’s still mind-blowing to me that recipes are done so quickly! The ‘IP’ has really become a dream come true in my busy household. My latest conquest is mashed potatoes. With an eye toward the holidays when every kitchen surface, oven shelf and stove top burner are bustling with delicious cooking, I wanted to master a recipe that could be done wholly in the Instant Pot. Voila! 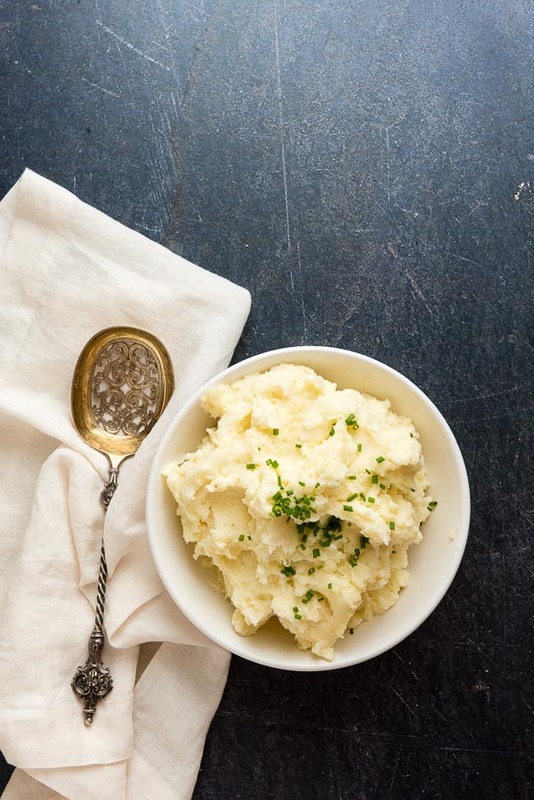 The Instant Pot Sour Cream and Garlic Mashed Potatoes recipe is just the ticket. For mashed potato traditionalists, don’t let the sour cream and garlic mention scare you off. There is enough sour cream to perk up the flavor but not make the potatoes overly tangy, and enough garlic to add a nice flavor without warding off vampires. I love that these creamy potatoes are made only in the Instant Pot too so you won’t have extra bowls to clean up. 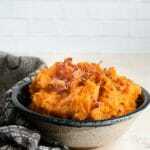 For this recipe russet potatoes are key. They have the right consistency to make creamy mashed potatoes. Yukon Gold variety potatoes are another favorite of mine though they tend to become heavier when making mashed potatoes. Stick with the classic russets for the end result you see here. I personally prefer to put potatoes through a potato ricer to get the best consistency and ensure no lumps. If you have not used a ricer before they are easy, and the results speak for themselves; trust me, you’ll love having it in your kitchen arsenal. Just add cooked potatoes into the cavity and squeeze the handles together. The potatoes are pushed through the small holes of the disk in the ricer back into the bowl (or in this case the Instant Pot insert) to be mixed with the other ingredients, making creamy mashed potatoes. A traditional potato masher may also be used (I’ve done it both ways), though I really feel the ricer makes the smoothest mashed potatoes. 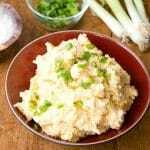 As with most Instant Pot recipes, this Instant Pot Sour Cream and Garlic Mashed Potatoes recipe is fast and easy. Once mashed, the potatoes may stay in the Instant Pot on the warm setting until serving. They are best right after they are made but with a busy holiday meal like Thanksgiving, coordinating everything to be done at the same time can be tricky! For creamy mashed potatoes made fast, the Instant Pot pressure cooker can't be beat. These potatoescook for 8 minutes, are drained and the other ingredients added in the Instant Pot insert on warm to curtail extra clean up of additional bowls. An estimated time for the Instant Pot to come to pressure has been included in the total recipe time. Place the potatoes in the Instant Pot on the trivet with 1 cup water. Set the Instant Pot on Manual, High Pressure for 8 minutes. After 8 minutes do an instant release and pour the contents of the Instant Pot into a colander in the sink to drain (be careful of steam from the potatoes) and return the metal insert to the Instant Pot. With the Instant Pot on the Warm setting (the default setting following a pressure cooking operation) add the butter and garlic into the Instant Pot insert allowing the butter to melt. Add the Half and Half, stir to mix in. Preferred mashing method: before returning the drained potatoes to the Instant Pot, process them through a potato ricer into the Instant Pot insert and stir to combine with the butter mixture. Stir in the sour cream and salt to taste. Serve immediately. Alternative mashing method: Return the drained potatoes to the Instant Pot and using a potato masher, mash the potatoes, stir to combine with the butter mixture. Stir in the sour cream and salt to taste. LOVE mashed potatoes. Especially garlic mashed! Yummy. There is nothing better than an amazing bed of amazing mashed potatos. I am going to have to try them this way. Ooo I bet adding sour cream to the mashed potatoes would be delish. I bet it makes it flufflier too! I haven’t tried this kind of dishes and it really looks yummy. 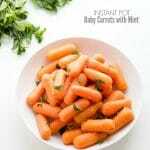 Glad that you share this recipe I will try this on weekend. I love my potato masher, but I’m going to order a ricer based on your recommendation. Then I will find 6 or 8 friends to invite over so I don’t eat this entire recipe myself at one sitting, it looks so delicious! This dish looks absolutely delicious. I would make this for Thanksgiving next week! I’m going to try this for sure! I’ve had my Insta Pot since last year and haven’t opened it yet! Thanks for the recipe! Aren’t instant pot potatoes the best!? I love making potatoes in the instant pot, I’m going to have to try your recipe, it looks yummy. All hail the mighty potato recipe! With Thanksgiving coming up, I’m daydreaming about all the yummy foods I’m going to eat. These will certainly need to be on the menu. looks like an easy way to cook. My husband has his ,method and it takes around 15 mins. this is faster.